Allergic rhinitis can be severely debilitating whether seasonal (classic hay fever) or persistent (from animal danders or house dust mite). There are many studies showing severe effects on a person’s quality of life and some even showing effects on a child’s exam performance. Usual treatment involves the use of: regular antihistamines, regular nasal steroid sprays and eye drops. Whilst these are effective treatments for some people, there are others who do not respond as well. 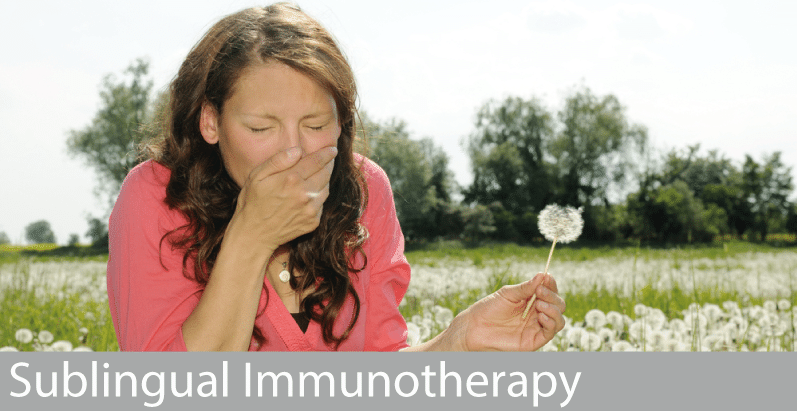 Immunotherapy is a “disease modifying” treatment and involves administering gradually increasing doses of an allergen extract (eg pollen). It works by altering the body’s immune response to allergens. Immunotherapy is now available for a wide range of allergens including grass and tree pollens, house dust mite, animal danders, bee and wasp venom. Dr Orton specialises in the use of sublingual immunotherapy (SLIT) where the dose of allergen is administered under the tongue, instead of using injections. It needs to be taken on a daily basis but after the first observed dose the treatment can be continued at home by the patient without direct supervision. It is also suitable for children from the age of 6 yrs onwards. Immunotherapy treatment for grass pollen allergy generally commences in February and for tree pollens in December. A course of this immunotherapy lasts three years. The benefits of this treatment appear to be long-lasting and well beyond the treatment period.